Below you fill find all funeral homes and cemeteries in or near Toledo. Popular neighborhoods in Toledo include: Toledo, and OH Metropolitan Statistical Area. Suburbs of Toledo: Sylvania Township, Sylvania Twp, Ottawa Hills, Blue Cross Hosp Serv, Business Reply Firm ZIP, Champion Spark Plug, Chrysler Corp Toledo Assy, Courtesy Reply Firm Zip, Dept of Public Utilities, Natl Family Opinion, Northwood, Oregon, Owens Corning, Owens Illinois, Toledo Blade, Toledo Edison. Family Owned: In this region, which is dominated by huge chains and multinational conglomerates, we proudly remain independent. 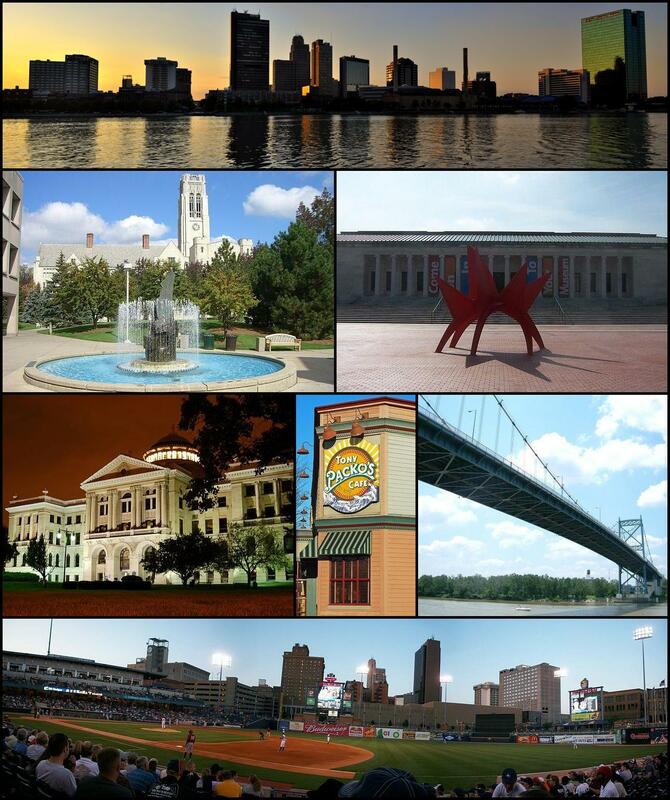 Toledo is also known as: s County / Toledo city and Adams Township, Lucas County, Ohio. Their current mayor is Mayor Paula Hicks-Hudson. Zip codes in the city: 43601, 43603, 43604, 43605, 43606, 43607, 43608, 43609, 43610, 43611, 43612, 43613, 43614, 43615, 43617, 43620, 43623, 43635, 43652, 43654, 43656, 43657, 43659, 43660, 43661, 43666, 43667, 43681, 43682, 43697, 43699. Lucas County funeral flowers can be purchased from one of the local funeral shops we partner with. There are currently 43 funeral options for this city. Some of the notable people born here have been: Martin Frankel (businessperson and financier), Alyson Stoner (model and actor), Katie Holmes (actor and model), Casey Biggs (actor), Jon Giesler (american football player), Bryan Robinson (american football player), and Sam Brandon (american football player). Toledo is home to the following sports teams: Toledo Storm and Toledo Mercurys. Toledo (/təˈliːdoʊ/) is the fourth most populous city in the U.S. state of Ohio after Cincinnati, Cleveland and Columbus and is the county seat of Lucas County. Toledo is in northwest Ohio, on the western end of Lake Erie, and borders the state of Michigan. The city was founded in 1833 on the west bank of the Maumee River, originally incorporated as part of Monroe County, Michigan Territory, then re-founded in 1837, after conclusion of the Toledo War, when it was incorporated in Ohio.Toledo grew quickly as a result of the Miami and Erie Canal and its position on the railway line between New York and Chicago. It has since become a city well known for its art community, auto assembly, education, healthcare, and local sports teams. The city has also become known for its glass industry which has earned the nickname, "The Glass City".The population of Toledo as of the 2010 Census was 287,208, making it the 67th-largest city in the United States. The Toledo metropolitan area had a population of 651,429, and was the sixth-largest metropolitan area in the state of Ohio, behind Cincinnati-Northern Kentucky, Cleveland, Columbus, Dayton, and Akron. It was revealed by Athens Banner-Herald on March 29th, 2019 that Colleen Jeanne Bach perished in Athens, Georgia. Bach was 78 years old and was born in Toledo, OH. Send flowers to express your sympathy and honor Colleen Jeanne's life. It was disclosed on March 28th, 2019 that Peter Francis Borer perished in Naples, Florida. Borer was 78 years old and was born in Toledo, OH. Send flowers to share your condolences and honor Peter Francis's life. It was disclosed by Sarasota Herald-Tribune on March 19th, 2019 that Gary McKinley Snyder passed on in St Petersburg, Florida. Snyder was 83 years old and was born in Toledo, OH. Send flowers to share your condolences and honor Gary McKinley's life. It was written on March 17th, 2019 that Ruth Marie Burns (Fox) passed away in Battle Creek, Michigan. Ms. Burns was 94 years old and was born in Toledo, OH. Send flowers to express your sorrow and honor Ruth Marie's life. It was revealed by Sarasota Herald-Tribune on March 15th, 2019 that Robert Donald Cravens died in Bradenton, Florida. Cravens was 73 years old and was born in Toledo, OH. Send flowers to share your condolences and honor Robert Donald's life. It was reported on March 13th, 2019 that Barbara Mae Amundsen (Frontz) perished in Zephyrhills, Florida. Ms. Amundsen was 83 years old and was born in Toledo, OH. Send flowers to express your sorrow and honor Barbara Mae's life. It was noted by Statesville Landmark on March 8th, 2019 that Michael James Haag passed away in Statesville, North Carolina. Haag was 70 years old and was born in Toledo, OH. Send flowers to share your condolences and honor Michael James's life. It was reported by San Diego Union-Tribune on March 3rd, 2019 that Sandi K Miley (Branchard) perished in Carlsbad, California. Ms. Miley was 78 years old and was born in Toledo, OH. Send flowers to share your condolences and honor Sandi K's life. It was reported by Buffalo News on February 20th, 2019 that Edward J Sutherland perished in Batavia, New York. Sutherland was 91 years old and was born in Toledo, OH. Send flowers to share your condolences and honor Edward J's life. It was reported on January 30th, 2019 that Carl H Anthony passed away in Naples, Florida. Anthony was 91 years old and was born in Toledo, OH. Send flowers to express your sympathy and honor Carl H's life. If you are planning or pre-planning a funeral, iMortuary can help you. iMortuary lists local funeral homes, Toledo's cemeteries, funeral flower arrangements, cremation providers, among its options to help you with your funeral planning needs. Browse below to find the funeral providers close to you. Toledo's rise to the fourth largest city in the state is rooted in its commitment to industry. In the 20th century Jeep, Chrysler, and General Motors had production facilities in Toledo. It is also coined the "Glass city", for tradition of manufacturing and the creation of new glass products. Today, more of Toledo's residents are employed in the healthcare industry than manufacturing. The official website for the city of Toledo is http://www.toledo.oh.gov. Toledo, OH 43604; or to the Ursuline Center, 4035 Indian Road, Toledo, OH 43606. Condolences may be expressed at www.newcomertoledo.com. Arrangements are by Newcomer Funeral Home, Toledo. Listing all funeral homes in Toledo, Ohio so you can easily send flowers to any location (same day delivery) or find any funeral service. We work with local florists and flower shops to offer same day delivery. You will find budget sympathy flowers in Toledo here. Our funeral flowers are cheap in price but not in value. What is the Difference between a Mortuary and a Funeral Home?